This past weekend, I was browsing at the UTC Williams-Sonoma store, and saw a bunch of really cool baking pans and gadgets that I wanted to get. What really caught my eye was a Tartlet Baking Set… it’s a non-stick tartlet pan (it looks like the tart version of a muffin pan) that comes with a scalloped tamper, and a scalloped round cutter for the dough circles. I had a 20% off coupon, so I got the set for about $24 – which was a great deal! You can buy similar pieces a la carte… but the nice thing about this set is that all the components are designed to work together… so no trial and error needed with items purchased separately! If you have a regular wooden tamper – it works ok with tartlet shells or a separate tartlet pan – but since it doesn’t have scallops, it’s not quite as easy to use. 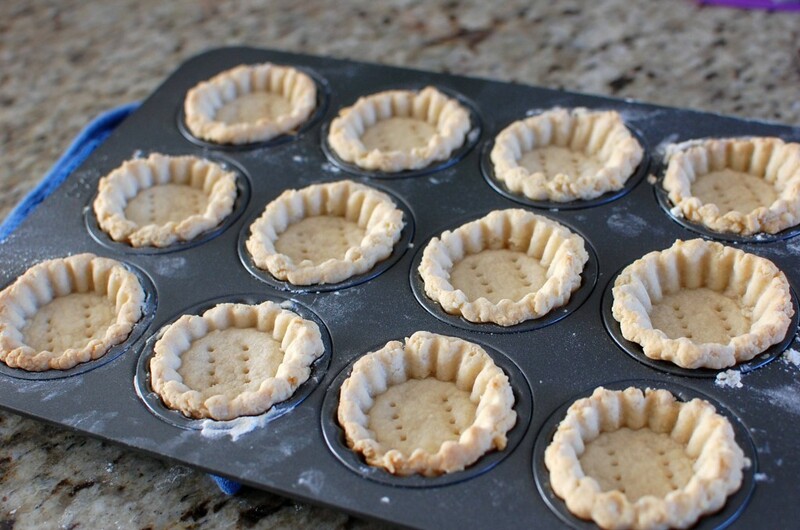 When making tarts – whether creating something savory or sweet – I like to start with a pre-baked tart shell. You could fill the raw dough in the pan and then bake… but it can get messy… and because the tart shells are so shallow, your filling is likely to overcook by the time your pastry shell is completely baked. 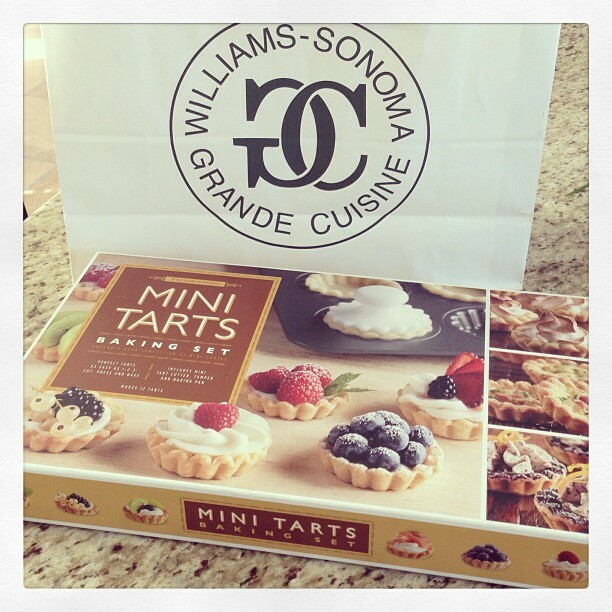 I’ve developed a few recipes for various mini-quiches and dessert tarts that I will post very soon. 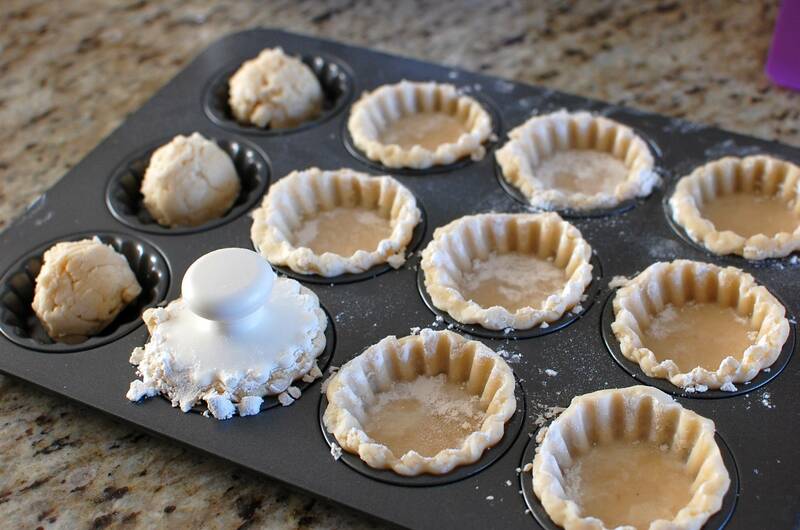 In the mean time, I’ll explain how to make the pre-baked tart shells – these are a great starting point for so many different appetizers and desserts! There are two methods to making tart shells that I use. 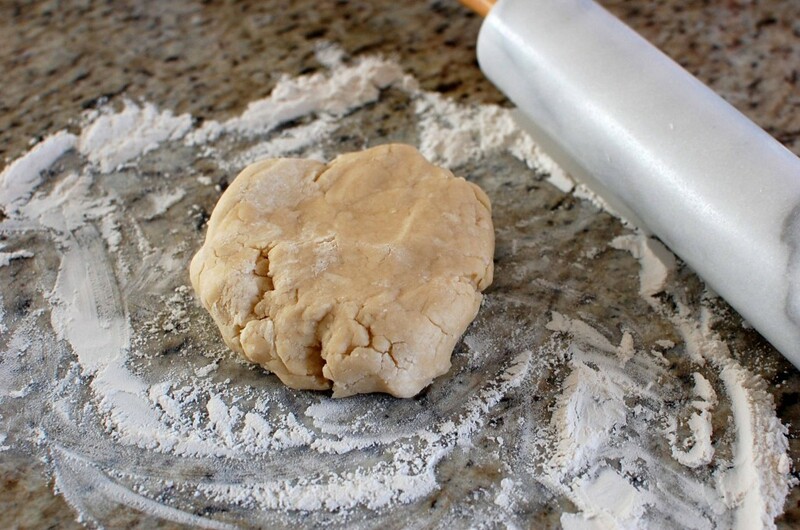 There is the proper method for rolling and cutting out the dough – and I think this method really works the best. 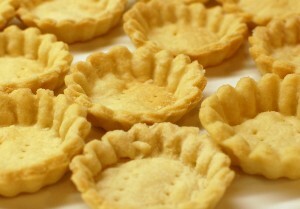 You will have prettier tarts, and will be able to get a large amount of tart shells from one recipe of dough. 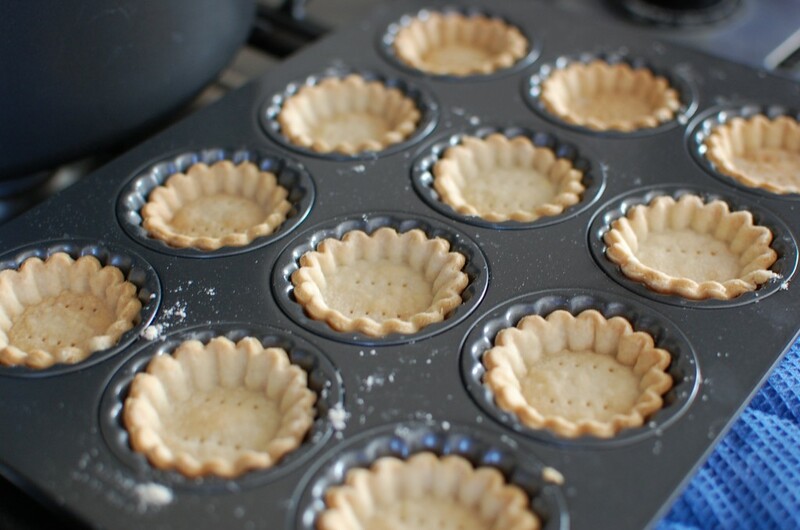 If you are in a time pinch, and only need a few tarts – and if you don’t mind that the tart shells are a bit thicker – then you can use my lazy method for making tart shells (which is also listed below). 1. First make the pastry. 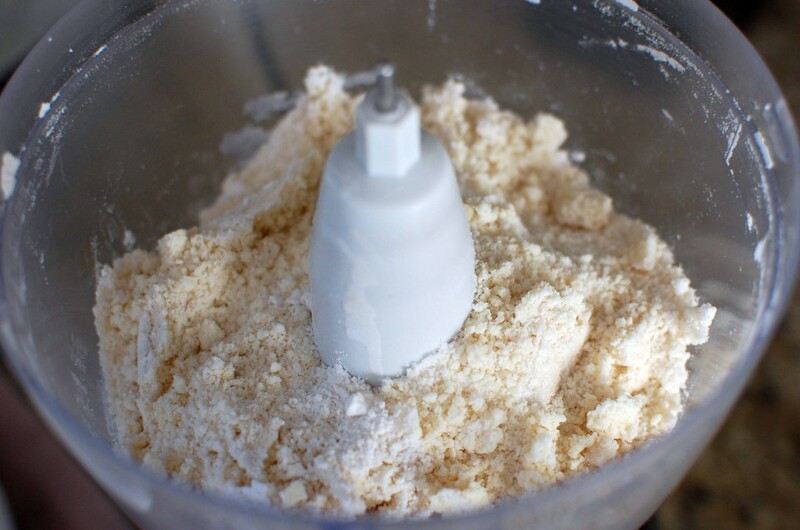 Pulse the butter, salt, sugar, and flour in the work-bowl of a food processor until the texture of crumbs. 2. Add the sour cream, then process until the dough comes together. Pat the dough together into a ball and let rest for 5 minutes. 3. There are two different ways you can make the tarts. The lazy way (which I’ve done… and has it’s benefits…) and the proper way (which makes a larger amount of nicer looking tarts). Instructions for both methods are here. 4. 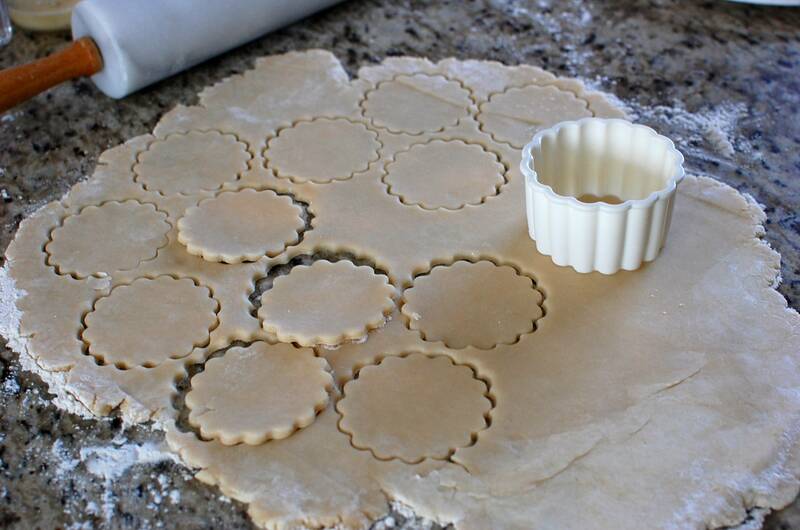 Using the provided scalloped (round) cookie cutter, cut as many circles of dough as you can. (You can re-roll the scraps and cut more afterwards). 5. Place the dough rounds into the UNGREASED tartlet pan, and push down gently with your fingers so the dough is centered in the well. 6. 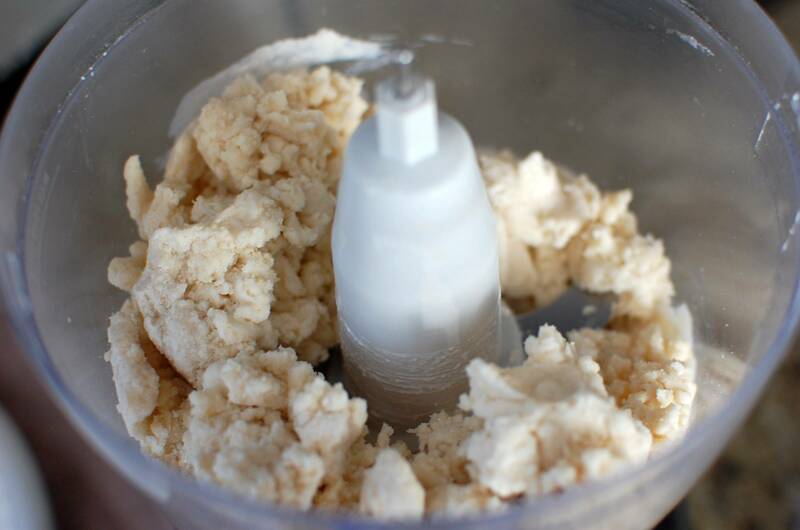 Dip the tamper into flour and tap the excess off. Firmly press your tamper into the dough well, putting enough pressure in so that the dough rises up the sides to be level with the top of the pan. 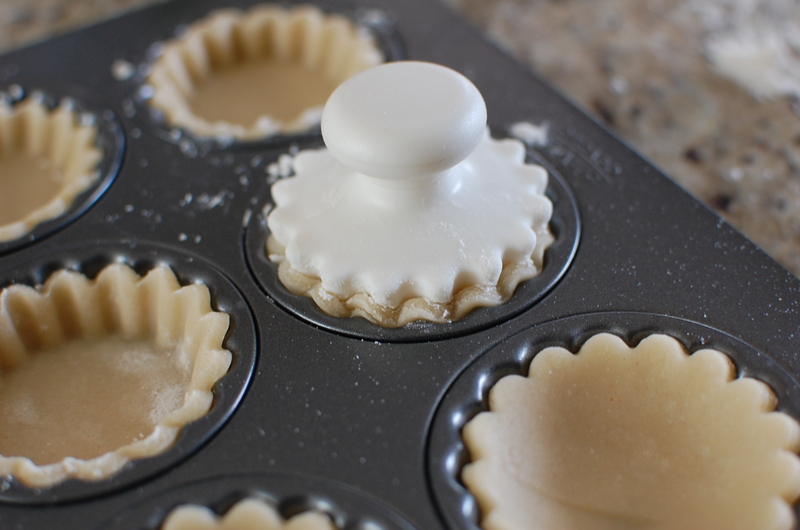 (If you don’t press firmly enough, you will have REALLY small/shallow tartlet shells!) You can move the tamper back and forth (and side to side) a little bit to make sure the dough rises evenly around the rim. 8. This step is important – use a fork to prick the bottom of the crust! (If you don’t prick the crust, it will bubble up during baking, and your tart well will be even more shallow.) 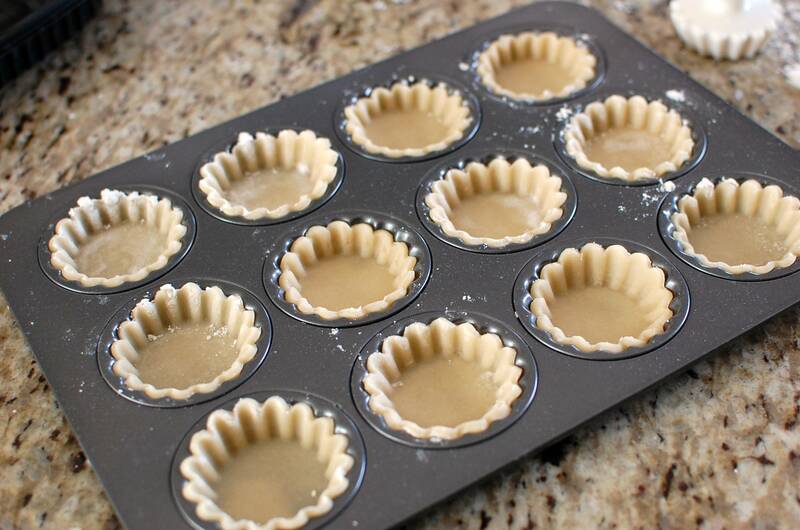 Put the tartlet shells into the oven and bake for about 12-14 minutes until light golden brown. 9. Remove from the oven and transfer to a plate or rack to cool. Rinse out the pan with cold water and dry thoroughly before reusing to make more shells with the leftover dough. I usually end up with 33-34 total shells using this method. You can now fill the shells with sweet or savory filling! 10. Now for the lazy method. I would only do this in a pinch, and if you don’t really care what the tarts look like. Why? Because the tart shells come out a bit uglier, and thicker – so you have less of them (I can only get about 14 tart shells using this method). But sometimes you might want a thicker tart shell… and sometimes you might want the “rustic” look… so go for it then. 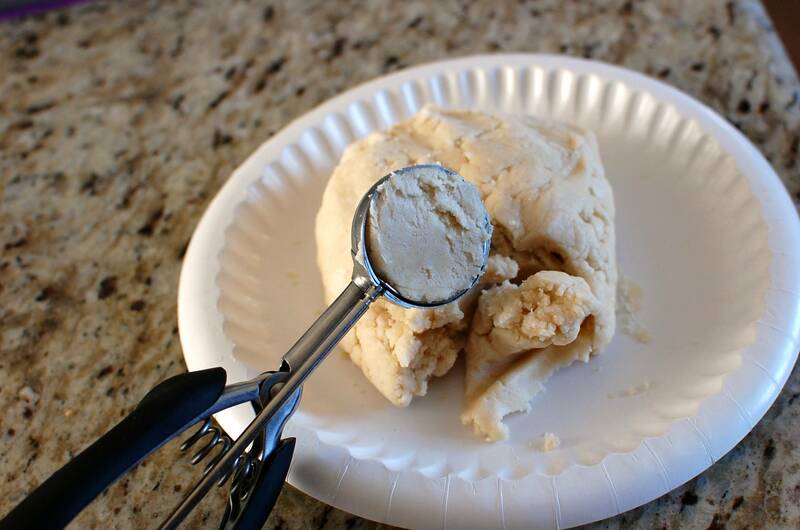 Using the same dough, take a cookie scoop, and scoop level portions of room-temperature (do not chill it!) dough. 11. Place each dough ball into one of the tartlet depressions. Dip the tamper in flour, then just smash it down into the center of the dough ball. 12. Remove the tamper, and now you have a very thick tartlet shell. Prick the bottom with a fork, then bake 15-17 minutes at 350 degrees until light golden brown. You’ll end up with about 14 tartlet shells that you can now fill and serve. 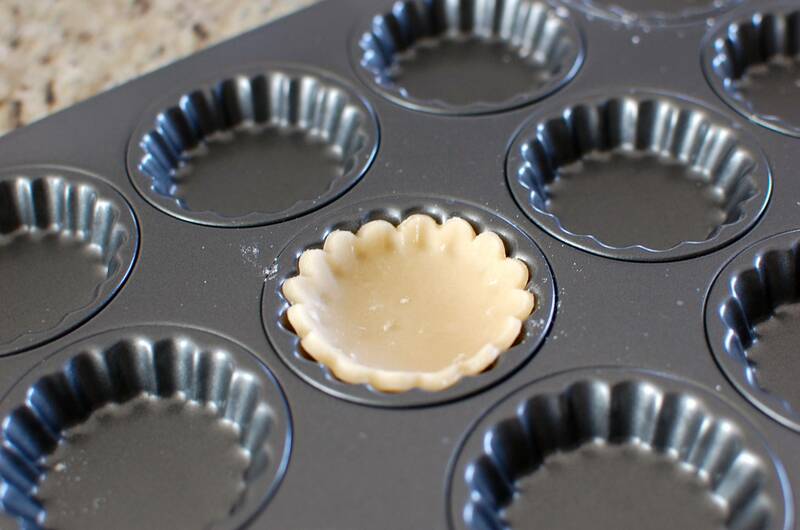 Now that you have tartlet shells… what do you do with them? Try my recipes for mini tartlet desserts, or mini quiche appetizer bites! So cute. Looks delicious all by themselves already. Hi Amy! 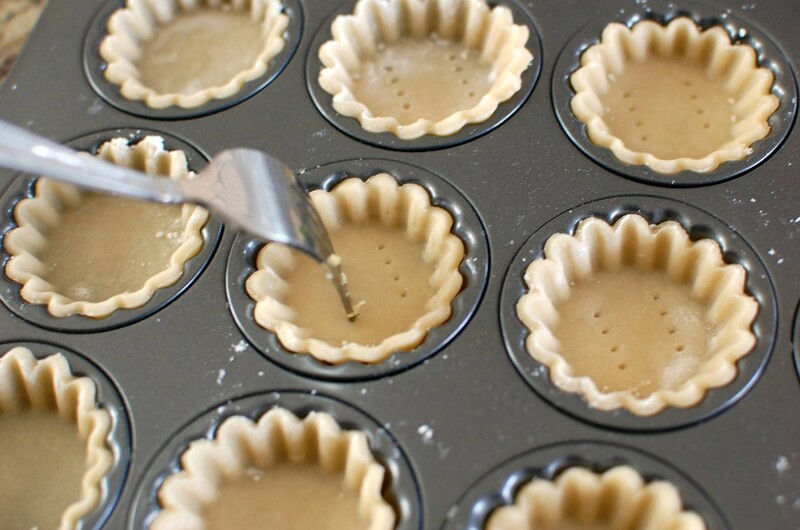 You can probably bake the tartlet shells several days in advance… I probably wouldn’t do more than 2-3 days though. And don’t get me started on Williams-Sonoma! They hooked me and now I find myself browsing their website for all the things I want to buy… it is a really good tartlet baking set though. I’m happy I bought it! speaking of Williams-Sonoma website, have you look into their Philips pasta maker machine? I just looked it up – that’s a fancy pasta machine! I think if you make pasta a lot, it could be a good value… but it is rather pricey for once in awhile use. Since I don’t make pasta that much, my $20 hand crank machine is an oldie… but it works. But being the kitchen appliance junkie that I am… now I really want the Philips! would it be ok to freeze the tart shells for a couple weeks beforehand and just bring out to defrost the morning of? Sure! Just make sure you wrap the shells tightly with plastic wrap so they don’t pick up odors from the freezer. If I make them Friday for Sunday filling how do I keep them nice? Sorry for the late reply. I would store in a ziplock bag with the air squeezed out and refrigerate. Can these be frozen unfilled? Probably. I’ve never done it, but if you tightly wrap in plastic… I don’t see why not! If you can’t find sour cream, then yogurt or heavy cream might be a decent substitute. does the crust suppose to become like a balloon when bake? it went down on its own after. any tips on my second trial? It’s normal for the pastry to shrink somewhat after baking. If you find that your pastry tends to puff up while baking, you need to make sure you “dock” (prick it with a fork) the pastry before baking. (Don’t forget the sides!) This will allow steam to vent, so that it doesn’t blow up your pastry like a balloon. Such a nice job on this tutorial! I am an experienced baker,mbut I like to see what other folks are trying. You have likewise Sold me that tartlet pan! I will be waitting for a nice online sale and then adding it to my kitchen. Great advice for you or anyone else who bakes: King Aurthur Flour has been a source of great support and great products for me for years now. One of their bloggers has started putting out more and more great baking advice blogs. She did one on pastry that addresses the shrinkage thing by explaining what causes it and how to try to prevent it. She’s taught me many things at mom and grandma never thought of! Here’s a link if you’re interested. Happy baking. Jen. Will you still yield 33-34 when using a mini muffin tin? Or should I double it just in case? Mini muffin pan depressions are a bit deeper than the Williams Sonoma tart pan. I would double the recipe just in case. You can always freeze the extra tart shells if you make too many. Wanted to know if we should add sugar in the tart dough recipe even for making savoury tartlets? Usually the dough has no sugar? Yes, I always add the sugar – even for savory tarts. It’s such a small amount of sugar… you can leave it out if you want to, but I think it helps to add some depth of flavor to the dough. I experimented with the tart shells. Turned out pretty decent but i felt they were more salty than sweet. I used half recipe. They seemed to be meant more for savoury fillings. U think i might have gone wrong somewhere? The tart dough is not meant to be overly sweet… it is a neutral base that can go with either sweet or savory fillings. If you want to sweeten it up a bit, you can add a few more T. of sugar. Hi. Nice to see this recipe as I have lost an old favorite. I will try this one, with one question. I want to fill with a homemade venison mincemeat, which I usually bake in a pie. Can I fill the tart with the mincemeat before baking? Thanks! I don’t see why not… but I’ve never made a mincemeat pie, so I am unfamiliar with the process. You can always try it as an experiment and see how it comes out? Have you ever successfully baked these with any kind of filling in them? Is there anything else I can use instead of sour cream – some people in my house cannot have dairy. If you can’t have dairy, try substituting the butter in the recipe for margarine or butter flavored crisco. Substitute the sour cream for half margarine/crisco, then add a little bit of cold water 1 T. at a time to moisten the dough. It won’t be exactly the same, but should work out ok. Yes you can freeze them. I’ve never frozen them before baking, but I don’t see why you couldn’t. I have frozen them after baking (tightly wrapped in plastic) – defrost in the refrigerator overnight before using the next day. Why do you need unsalted butter then salt, why don’t you just get normal butter? Because then it would be too much salt! You want a little bit of salt to add flavor… but if you use salted butter then your tarts will be too salty! I just made these and I poked them like you said to. And they bubbled and became greasy. I’m sorry I’m not sure? I got mine at Williams-Sonoma here in the USA. Hi, Mika! These look perfect! How does this tart shell recipe hold up over time? Do they stay crispy for a day or two, or do they become soft and/or crumbly? Your pictures are gorgeous. Thank you! Hi there! If you refrigerate or freeze the tarts they will stay fresh for a few days.. but I’m not sure if I would use the word “crispy”. The texture will be more like a refrigerated pie crust. If you want to make sure they have that fresh out of the oven texture, maybe prebake them… but subtract a few minutes so that they are slightly underdone. Then the day you want to serve them, bake them the remainder of the time (preheated oven, tart shells going in at room temperature). I’m new here. And I’m German.i would like to bake with your recipe but I don’t know what means the c.
For example 1/2 c. butter.Please answer quickly, because I want to surprise my mother-in-law. Hi sorry for the delay. 1 c. = 1 cup. It’s an American volumetric ingredient. 1 cup = about 237ml (or cc). Is this a flaky tart shell recipe? I am questioning it because of the sour cream in the recipe. I don’t think it’s overly flaky, no… it’s more tart like texture… hard to describe. I use a variation of this for my pie crust, but more tender than flaky. Hi, what type of flour should I use? Regular all purpose flour is fine. You can also use pastry flour. I think I love you!!! Thanks for the recipe. I added in a little more sugar and it was totally fantastic as a sweet pastry. Thank you so much for sharing. At last my husband is happy (he hates puff pastry, can’t chew it he says). And… so easy to do. You are my hero!